“Weekly Marks”, found at weeklymarks.com, is a link posting scam, plain and simple, only now they have redesigned it to look like a leadership and career planning company website. I am not shocked at the way the scammers who run Weekly Marks have found a new way to peddle their dishonest product, but I am more concerned about the people who might fall for this wolf’s new sheep clothing. There are some dead giveaways, though. For one, the address they list on the Weekly Marks website is a car dealership in Los Angeles. Also, the Weekly Marks phone number was answered by the car dealership who told us they get a lot of complaint calls. The previous Weekly Marks website design was the usual scam design these crooks have used for years that had a fake working home mom, Mary Stevens, and her fictional story along with other phony misinformation. It looks like they got wise to us and others who keep exposing these scams and decided to use a different more professional business appearance. Make no mistake though; Weekly Marks is still the same scam with a new look but with new phony info to mislead you. The sole purpose of this scam is to get you to sign up and give them your personal info on the opt-in page so they can go after you and get as much money as they can. 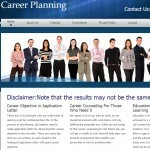 This new approach has you believing it’s a career planning consultant firm. Weekly Marks is anything but. Once they have you their boiler room operatives will do their best to sell you worthless business coaching programs. These can run into the tens of thousands over time and before you know it, your bank account is empty and they are nowhere to be found when you go looking for them. Some of the biggest scams Weekly Marks has promoted were the infamous link posting scams known as Web Fortune Vault and Profit Web System. These and other scams have been exposed by us some time ago and were eventually shut down by the FTC for committing fraud. These scams and Weekly Marks use the lure of working from home making “big money” by posting ad links online without the need for skills or experience. That is the bait. The switch is upselling you to more expensive “training” products that will do absolutely nothing for you. It is somewhat ironic that their name, Weekly Marks, uses the shady carnie slang “marks”, which is a term for unsuspecting people they’re about to swindle. So, in effect, if you sign up with Weekly Marks, you will be one of those marks they avow to rob blindly before you even know their hand was in your pocket. The truth is that working in the affiliate marketing field is so risky that it can take years and lots of investment in order to establish oneself. The new scam that Weekly Marks is running will undoubtedly be to get you to spend as much of your money on their business in exchange for empty promises of impending success. These scammers change their tactics as often as watchdog sites like ours uncover these frauds, and the worst part about this new design is that it makes it look like Weekly Marks might be a legitimate consulting firm. As stated previously, their address and contact number go to a car dealership so that should tip you off right there! The FTC is starting to go after fake news sites that peddle these scams, so now the designs will start looking like real businesses, which Weekly Marks appears to be. So they changed their design to keep on fooling everyone, and that is a dangerous thing which we will be on the lookout for even closer now. Beware. Weekly Marks is not a career planning help site. They will not only NOT help you but they will help themselves to as much of your money as they possibly can. Stay away from this horrible scam.